Welcome to our landscape architecture website. We are a landscape firm located in the state of Sinaloa, Mexico. We do computer aided design and construction and are able to travel the Mexican Pacific Coast. This includes Baja, Sonora and Sinaloa, (Mazatlan). 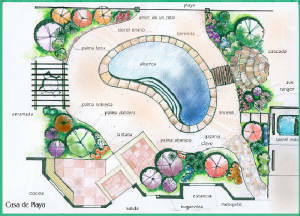 Let us design and build your landscape design in : Mazatlan, Los Cabos, San Carlos , Las Bocas, Camahuiroa! !